• All-inclusive customer service from processing orders efficiently to end-user technical support. We manufacture our polyaspartic coatings in Vancouver, BC, Canada. The most thorough, hands-on training in the industry. Come and install a couple of garage floors with the most knowledgeable applicators in Canada. We offer the only private training sessions available, and we train installing in residential garages, not in a classroom / warehouse. We manufacture the highest quality polyaspartic materials. • How long to install? • Return to service time? • Will my new floor last? IRONFLEX69 is a two-component polyaspartic polyurea floor coating based on patented technology, and designed to provide pigmented base-coats for tough and durable coating systems that incorporate a broadcast material. This polyaspartic aliphatic polyurea product has superior adhesion to concrete, yet still allows our installers to broadcast chips directly into this base coat. 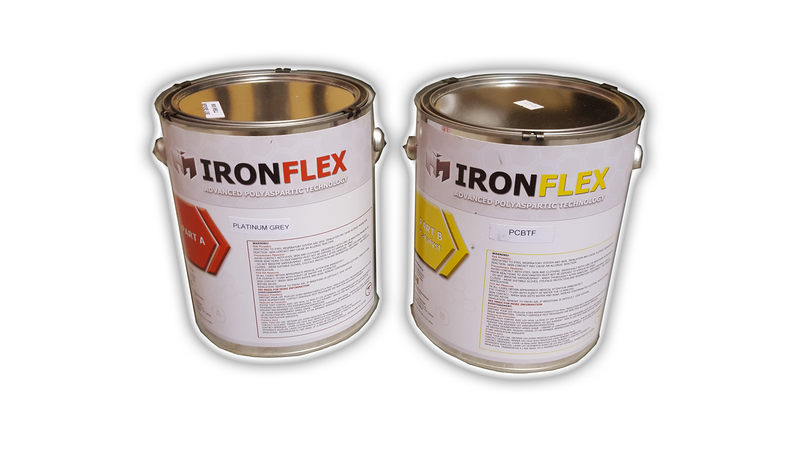 IRONFLEX69 is a 1:1 mix ratio product with an excellent working time and pot life. Ultra low VOC content. IRONFLEX69(SC) is designed as a pigmented base-coat/mid-coat for solid colour flooring solutions. Standard VOC content. • Twice as flexible as epoxies. * Concrete must have a minimum 30 days cure before application of product. © 2019 Iron Man Coatings. Inc. All Rights Reserved.